Almost everyone had that favorite stuffed animal when they were a kid. It was the toy that you cared about so much that it was almost real to you. For me it was a Cabbage Patch Kid that my parents bought for me at Christmas. The exciting part for me was that I actually was able to fill out adoption paperwork to take in this toy that needed a home. I think that we were made to want to share unconditional love. It’s a part of our make-up as human beings. Now, some of us have been shown a warped sense of love due to abuse, parents that didn’t know how to show love, whatever BUT the longing to share unconditional love still resides in us. I believe that’s is why kids seem to want to exhibit this unconditional love on their special toy(s). In the Diagon Alley area of the Wizarding World of Harry Potter at Universal Studios Orlando there is a shop called Weasley’s Wizard Wheezes. In the Harry Potter books this shop sells all sorts of fantastical joke items that are sold in the books including creatures called Pygmy Puffs. Our foster-adoptive daughter loved these little creatures from the books and was mesmerized by them in the movies. When we decided to take our first trip to Diagon Alley, she knew only one thing for certain… She was using her allowance money to buy a Pygmy Puff. I don’t think she spent as long anywhere else in Universal Studios as she did in front of the shelves holding the creatures. Her eyes scanned each Pygmy Puff as she tried to size up the one that she should choose. She finally decided on a cute purple ball of puff and held it in her hands as her face was beaming. Getting this new friend would be enough but there was more to the excitement. Anyone that buys a Pygmy Puff at Weasley’s Wizard Wheezes may ask the cashier to perform the adoption ceremony. Simply take your Pygmy Puff to the cashier in the Weasley store. Ask the cashier to perform the adoption ceremony. Kids from difficult pasts have been robbed of many opportunities for simple childhood fun. The ceremony gives them the joy of pretending to be in the Harry Potter books. Foster-adoptive children tend to come from situations where they feel like they did something dreadfully wrong or they feel guilty about their past. Why not put them in a store where a whole store full of people is applauding them for caring for a new “pet”? Through conversations with my daughter it seems that Pygmy Puffs in the store have been separated from their families. The adoption is giving them a new home since they will not be going back to their original home. Hmmm. It would seem that some foster kids might feel similar to a Pygmy Puff. They understand that they will not be going back home. While being scared like a Pygmy Puff sitting on a shelf, they simultaneously just hope that they will go to a nice and loving home. Talk to your kiddo(s) about the similarities in this situation and differences with foster care and adoption. You might just see what their minds are thinking about the whole process. 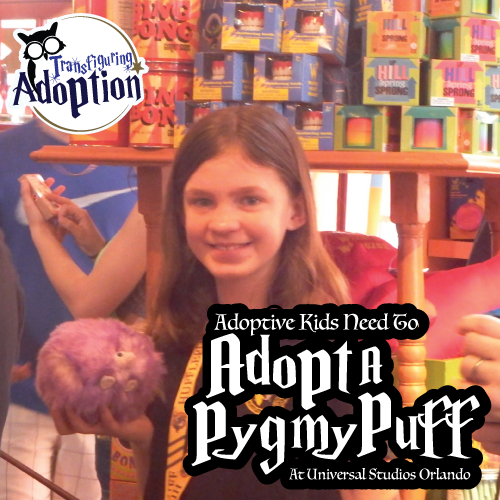 After someone adopts a Pygmy Puff, let it join in with the family pictures during your trip to the Wizarding World. Afterall most families try their hardest to make a new foster child feel like a part of the family. love this story! thanks so much for sharing 🙂 what a lucky pygmy puff! Thanks Nikki! Transfiguring Adoption is actually looking into the opportunity for some of our staff to take a few foster/adoptive families on a four day trip to Universal Studios and help the families navigate the parks successfully. Should the pygmy puff adoption be park of the trip?